Not to be confused with the Enzo Ferrari, which is sometimes referred to as the F60. For the F60 America model, see here. The F60, the 55th single-seater car produced by Ferrari to compete in Formula One, was named F60 to celebrate the fact that 2009 is Ferrari's 60th year in Formula One, the only team to have competed every year. It was first launched online on 12 January 2009, and Felipe Massa undertook the debut run of the car with a shakedown at Mugello later that day. The car was initially intended to debut at Ferrari's home Fiorano track, but the venue was changed due to poor weather conditions at Maranello. The F60's first full test took place at the Mugello Circuit during the week of 19 January 2009. On average, the Ferrari F60 is 1.9 seconds faster than the last car, despite the new regulations. In the 2009 season, FIA banned the large bargeboards in front of the radiator and the sidepods. It also placed limits on the wheelbase, making it shorter, simpler front splitter, narrower rear spoiler and certain underside air flows, so that it is less disruptive to the car behind. The Ferrari F60 responded to all of this by improving tiny details from the F2008. The front splitter is located further away from the front wheel, and now has only 1 layer. Ferrari claims this improves air flow to the wheels. The F60 is only fitted with 1-tread slick tires, and a simpler suspension positioned a bit backward in angle. Ferrari removed the large airflow plates and replaced it with a small one, also adjusting some underside air flow. The side mirrors are located at the edge of the car's floor. The FIA's ban on small side wings led to the creation of a "cleaner" sidepods acceptable of the smaller engine, and a smooth underside of the chassis. The rear diffuser is revised to meet the regulations that stated it has to produce less downforce. Felipe Massa driving the F60 at the 2009 Turkish Grand Prix. The F60 scored its first points in Bahrain, the fourth race of the season. Kimi Räikkönen finished sixth, gaining three points for Ferrari. Felipe Massa had an accident in the Hungarian Grand Prix involving a spring from Rubens Barrichello's Brawn GP car falling off and striking him on his helmet. He did not start the race and for the rest of the season, he was replaced by Ferrari test driver, Luca Badoer and ex-Force India driver Giancarlo Fisichella. 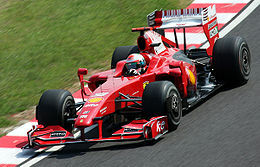 In early August 2009 Ferrari announced that they had stopped developing the F60 in order to concentrate on the 2010 car. The F60 won its first and only race of 2009 at the hands of Räikkönen at the Belgian Grand Prix, after starting 6th on the grid. They eventually finished fourth in the constructors standings, just behind McLaren, and making 2009 the worst season for Ferrari since 1993. Räikkönen was Ferrari's highest points scoring driver in 2009, finishing sixth in the standings with 48 points, one adrift of fifth-placed Lewis Hamilton of McLaren. ^ "F60: Technical Specs". Ferrariworld.com. 2009-01-12. Archived from the original on July 16, 2009. Retrieved 2009-08-18. ^ a b Noble, Jonathan (2009-01-12). "Ferrari first team to unveil 2009 car". Autosport. Haymarket Publications. Retrieved 2009-01-12. ^ "Ferrari first to debut as F60 is unveiled". Formula1.com. 2009-01-12. Retrieved 2009-01-12. ^ Noble, Jonathan (2009-01-05). "Ferrari to launch new car next week". Autosport. Haymarket Publications. Retrieved 2009-01-12. ^ Noble, Jonathan (2009-01-10). "Ferrari move new car launch to Mugello". Autosport. Haymarket Publication. Retrieved 2009-01-12. ^ "Ferrari move first F60 test to Mugello". autosport.com. 2009-01-17. Retrieved 2009-01-18. ^ "Ferrari poised to stop 09 development – from". Motorsport.co.uk. Retrieved 2009-08-30. ^ "F1 News: Raikkonen: Third will be hard to keep". autosport.com. 2009-08-25. Retrieved 2009-08-30. ^ "F1 News:Raikkonen wins again as Fisichella stars". autosport.com. 2009-08-30. Retrieved 2009-09-02. Wikimedia Commons has media related to Ferrari F60. This page was last edited on 8 February 2019, at 05:56 (UTC).